In this superb programme wonderful footage of the Seven, the Elite and Elan; the Europa, Eclat and Exige deliver a heady mix of style and performance, whilst the saloon specials  Cortina, Sunbeam and Carlton  evoke memories of motoring thrills both on the off the track. This is the story behind the famous green and yellow ACBC badge. High quality archive and modern footage, spanning 1952 to the present day, blend with an authoritative commentary to take you though fifty years of automotive adventure and innovation. Its worthy salute to Lotus, truly the Best of British! To be honest I wasn't expecting to be a big fan of this video (also available on DVD). 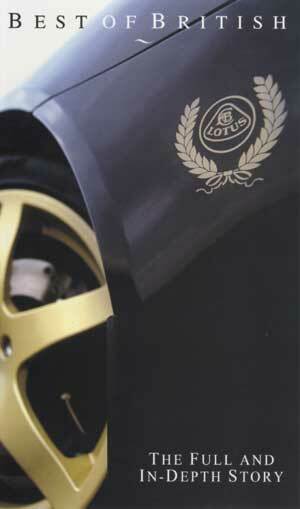 I'm not a great Lotus fan, more of an Esprit fan, not that I don't like other Loti, I just don't have the same passion. So a video about Lotus with the usual 10 sec clip of an Esprit wasn't going to wet my boat! My review copy arrived on Friday with my delight being most due to getting something free. Decided to watch it Saturday morning in bed while trying to wake up. I've seen a few Duke videos before, mostly bike videos. Quality isn't bad, but normally gives you a could-do-better feel. However this video gives you the feeling that's somebody's taken a little more care over it's production. The video covers the basic story of Lotus from Colin Chapman's early education and formation of Lotus, upto the release of the mark II Elise. All production models are covered from the Seven upto the Elise, with a few owner interviews and basic information on each model. Everything's covered bar the Lotus Cycle. 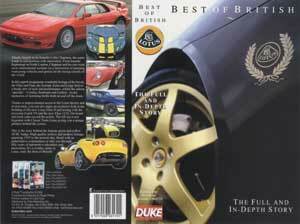 There's interviews with Club Lotus, the Lotus Drivers Club, Lotus Service Centre and a few bods from Lotus. There's also some track time with both the Esprit V8 and Elise II and a little bit on the Exige. They also take you along the Elise production line in the new factory block and a look at how they improved the Elise from Mark I to Mark II. One major flaw (probably due to time and space) was the lack of Lotus' achievements in Grand Prix. Now not being that knowledgable myself about all those GP wins, I would have liked to have learnt a little more. They do interview Colin Chapman's son who now runs the Classic Team Lotus Team, who now look after all the old Lotus GP cars and run some of them in Classic races, and there's some picture of Colin at a few GPs. All very interesting, but didn't learn much about Team Lotus. Although I'm sure it's covered in a video of it's own. Now for the important stuff! As this is Lotus Esprit World, what about the Esprit content? Well, It was never going to be enough to satisfy any Esprit nut, but then it's not an Esprit Video. They cover the Esprit within the models with infomation on the chassis and Giugiaro involvement with the styling. There's a bit of breeze over the models, with only the Giugiaro to Steven's and the 4-cylinder to V8 mentioned. But that's made up for with a look at the Esprit production line and some Track time with a 1999 V8. Esprits pop up throughout the video and if you're on the ball you can see my Esprit in the carpark at the Club Lotus Donington day (though you'll probably need slow motion and a magnifying glass). So in the end I really enjoyed the whole thing. As I said before there was never going to be enough Esprit content, but I was pleased with what there was and it's just nice to see an Esprit on your TV. The video is well researched and presented and is a must for all those Elise owners who haven't got a clue about the Lotus Story. If you've got a spare 96 minutes and £15ish then it's worth getting a copy. If you love anything to do with Lotus then it's probably worth twice the price.